It's together that we will think and create a brighter future! 1. We rely on 18 years experience of Metal Sculpture design, production and installation to provide the most suitable advices for material and technic of the products. 2. We have a team a experienced and highly qualified experts to design and manufacture genius product for you. 3. We can make different style and size of product according to your requirements. 4. We ensure that each of your inquiry/question do receive our prompt reply. 5. We guaranty a timely delivery based on the contract period. A:1.Shengfa has 18 years of metal Sculpture experience. 2.With high quality product, favorable price and timely delivery. 3.Reply to all your inquiries within 24 hours. A:we can produce even one piece.But if you need flowerpot and small sculpture,we will decide the MOQ based on the production cost of the model. A:we accept TT,but when the order amount is more than US$30,000,we can accept L/C at sight. A:1.our designer can provide the design of the sculpture according to your idea. 2.we can produce any size of sculpture according to our customer`s request. 3.we have a strict quality management system which guarantee that what we produce is what our customer is expecting. 4.after you confirmed the order,we will send you update pictures of the product under processing. Q5:How to install the sculpture? A:we will provide base drawing to install the sculpture.if you face any difficulty in installing the sculpture,we can also assist you and charge you accordingly. 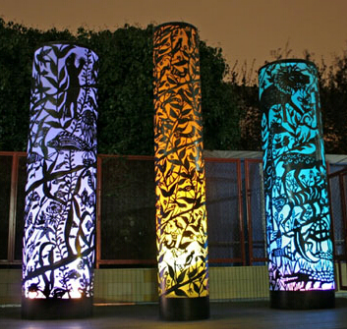 Looking for ideal Light Sculpture Manufacturer & supplier ? We have a wide selection at great prices to help you get creative. All the Stainless Steel 304 Material Metal are quality guaranteed. We are China Origin Factory of Matte Large Metal Garden. If you have any question, please feel free to contact us.